Synchronize Passes on a burn, poison, or paralysis to the foe. When this Pokemon becomes Burned, Paralyzed, or Poisoned, the enemy does too. air currents and predict its ene� my's actions. such as the weath� er or its foe's next move. 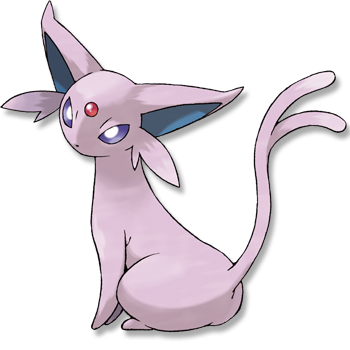 Emerald An ESPEON is extremely loyal to any TRAINER it considers to be worthy. It is said to have developed precognitive powers to protect its TRAINER from harm. FireRed By reading air currents, it can predict things such as the weather or its foe�s next move. Leaf Green It uses the fine hair that covers its body to sense air currents and predict its enemy�s actions. Diamond/Pearl Its fur has the look and feel of velvet. The orb on its forehead glows when it uses psycho-power. Platinum Its fur is so sensitive, it can sense minute shifts in the air and predict the weather. Heart Gold It uses the fine hair that covers its body to sense air currents and predict its enemy�s actions. Soul Silver By reading air currents, it can predict things such as the weather or its foe�s next move. Black Its fur is so sensitive, it can sense minute shifts in the air and predict the weather. White Its fur is so sensitive, it can sense minute shifts in the air and predict the weather.